Any new product line is always going to have its critics, mainly in the shape of people who want a completely different camera. As I said before, there are certain feature of the Canon XC10 that have been moaned about online, but largely by those who seemed to be wanting something that the XC10 isn’t. You need to think about the XC10 for what it is, and that is a small, lightweight video camera that can capture incredible quality 4k footage. With fantastic image stabilisation, especially in the HD setting, you can throw it in your bag every day and be ready to shoot whatever you come across, and with the picture settings available you can match the footage with other cameras in the Canon EOS Cinema range. Yes, the camera doesn’t have a large sensor, or XLR sockets, but it is light enough to go up on a drone, and it is small enough to use on or in a vehicle. 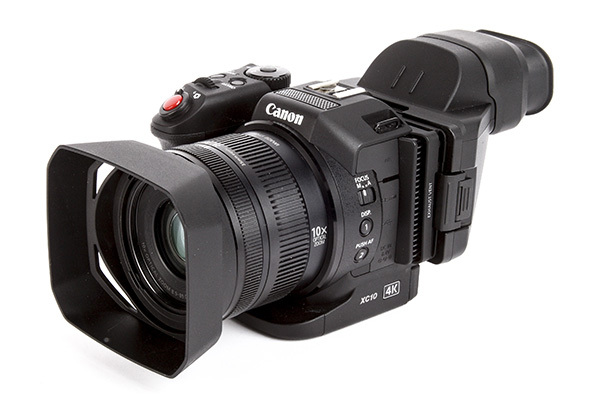 So for those videographers shooting at the higher end of the spectrum, it is an interesting B camera. For those starting out, it has all you need straight out the box to get really great footage. But the XC10 does have its quirks. The headphone socket is in annoying location, and the choice to make the 4K mode a CFast only option, rather than including the ability to record a lower bitrate to SD card, seems to be an oversight. Certain features of the handling could also be looked at. I think there is a lack of direct access buttons, particularly when the viewfinder is attached and the touchscreen can’t be used. On the whole, though, it is an excellent little camera that I enjoyed having in my kit bag, and I’m hoping to get out and shoot some projects with it in the coming months. If you are just starting in video then the XC10 is a good choice for an all-round camera, and even if you don’t have the facility to view and edit 4K footage at the moment, the 305Mbps bit rate should future-proof the camera for at least the next few years. Focus Control:AF, Face detection and tracking, Push AF, AiAF (Photo Mode) Manual focus ring Touch Focus Function. Aperture blades:8 blade diaphragm. Mechanical shutter built in.